Life isn't always neat and tidy. Much like I mentioned in my Pumpkin Oatmeal Scotchies post, I might look like I have it all together, but that isn't always the case. I've mastered the cool, calm, and collected front, but there are times my inner emotions differ greatly from the expression on my face. What am I saying? Looks can be deceiving. I've learned this time and time again, even in the kitchen. Take this recipe, for example. 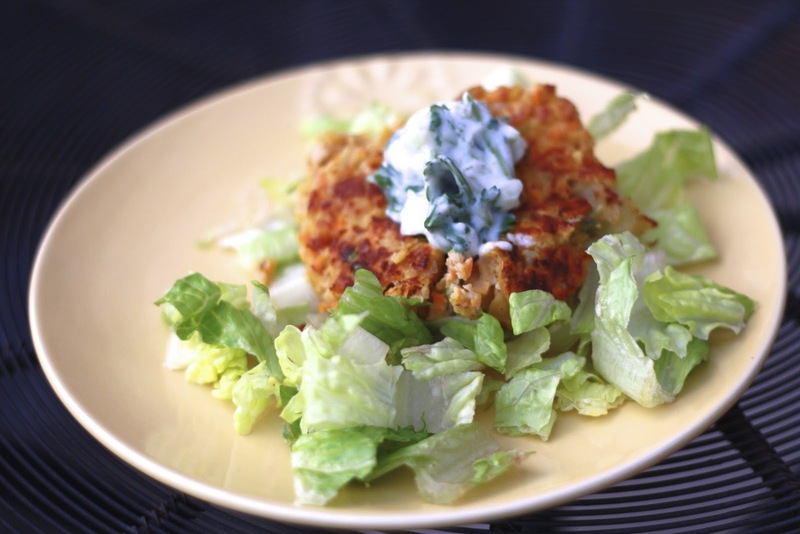 What you see in the picture above is a sweet potato chickpea patty, almost reminiscent of a crab cake. Although that it what is pictured, the reality of the situation is that those patties did not stay in patty form much beyond the photograph. In fact, I managed to keep one "patty" together long enough to snap a few shots, but the other 7 patties were in various states of crumble by the time we plated them and ate them. When my chickpea patties began to crumble as I tried to flip them in the skillet, I could have declared dinner a failure, tossed the contents of the pan into the trash, and ordered a pizza. Instead, we made do. We tossed the crumbled patties over romaine, topped it with a Greek yogurt sauce, and celebrated the fact that good food is good food, regardless of whether or not it looks the way it was supposed to. Sometimes life throws curveballs at us: big things like career changes or small things like a seemingly faulty recipe. 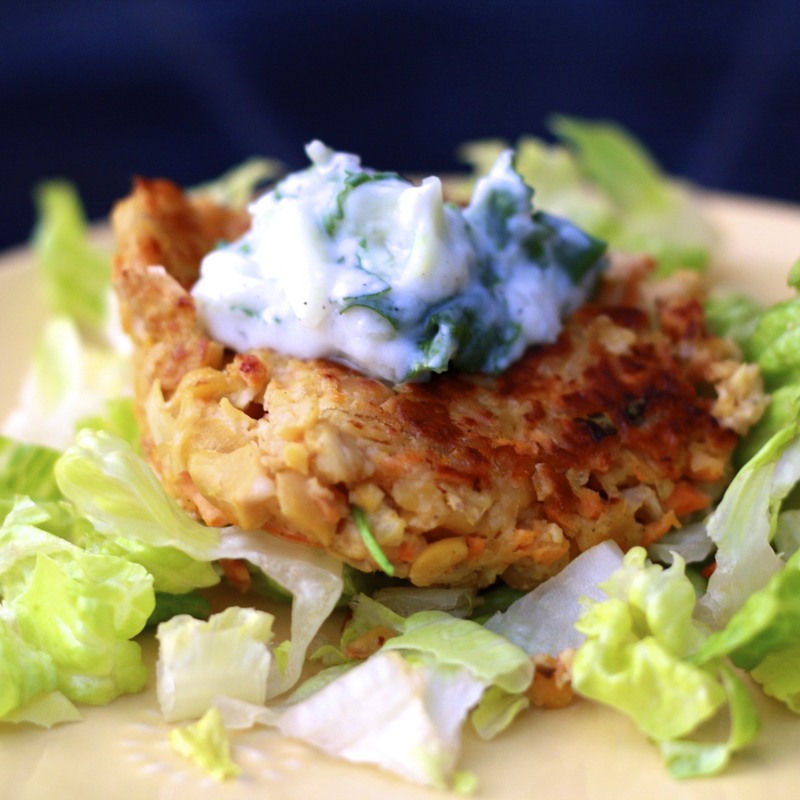 The secret to good living, in my opinion, is having the wisdom and strength to turn that curveball into something positive....as we did with these chickpea cakes! Packed full of some of my favorite healthy ingredients, this dinner proved that things don't have to turn out the way you want or expect to be considered successful! 1. Mix the cucumber, 3/4 cup yogurt, and 1/4 cup fresh cilantro (chopped) into a small bowl. Mix, season with salt and pepper, cover, and refrigerate until ready to serve (can keep in the fridge for 48 hours). 2. Shred sweet potato in the bowl of a food processor. Add chickpeas and pulse to a coarse puree with large chunks remaining (7-10 pulses). 3. In a separate large bowl, mix eggs, 2 tbsp olive oil, garam masala, cayenne pepper, and onion. Add sweet potato chickpea mixture and mix to combine. Stir in 1/2 cup Greek yogurt, bread crumbs, oats, and 1/4 cup cilantro. Mix well. 4. Using your hands, form mixture into patties (I made 8 patties the size of my palm). If making ahead of time, place on plate, cover tightly in plastic wrap, and refrigerate until ready to make (can keep in the fridge for up to 24 hours). 5. When ready to cook patties, heat 2 tsp oil in a large non-stick skillet over medium heat. Once shimmering, add patties to the pan and cook until well browned on each side (8-10 minutes). Repeat with remaining patties, adding more oil to the pan if necessary. Serve warm with the yogurt sauce and lime wedges.